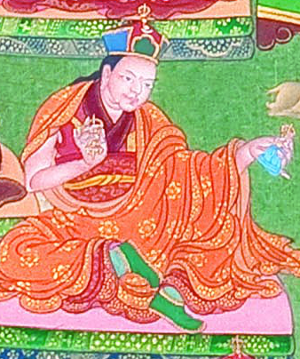 Rigdzin Pema Trinlé (Tib. རིག་འཛིན་པདྨ་འཕྲིན་ལས་, Wyl. rig 'dzin pad+ma 'phrin las) (1641-1717) — the reincarnation of Rigdzin Ngakgi Wangpo and Nanam Dorje Dudjom. He was the second throneholder of Dorje Drak Monastery. He was a student of the Fifth Dalai Lama. He wrote a famous history of the lineage of Düpa Do. Like Lochen Dharmashri, he was killed during the Dzungar war of 1717-18. This page was last edited on 22 June 2018, at 23:12.